The Cat Bus is waiting for you in a room on the second floor. It must be everyone's dream to touch and ride the Cat Bus. In order to make this wish come true, we made a room with an actual Cat Bus. 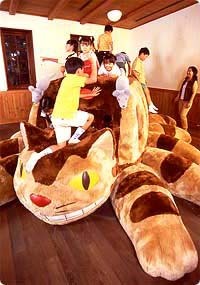 If you remember the Cat Bus from "My Neighbor Totoro", you have probably dreamed of touching its fluffy fur. Now you can do it. Next to the Cat Bus, a bunch of soot-black Dust Bunnies are waiting for you to play with them. We wanted to make the Cat Bus as big as it is in the film, but because it wouldn't fit in the museum, we ended up downsizing him a little bit. The Cat Bus is for elementary school children and under (age 12 and under) only.